And We said to the Angels: "SUBMIT (us'judū )to Adam," so they SUBMITted (fasajadū) except for Satan, he refused and became arrogant, and became of the rejecters. And We said: "Enter this town, and eat from it as plentifully as you wish; and enter the gate while PROSTRATing (sujjadan), and Say: "Our load is removed", We will then forgive your mistakes, and We will increase for the good doers." And who are more wicked than those who boycott God's TEMPLES (masājida); so that His name not be mentioned in them; and they seek their destruction? They will not be able to enter them except in fear; they will have humiliation in this world and in the Hereafter a painful retribution. And We have made the sanctuary to be a model for the people and a security. And utilize the place of Abraham to reach out. And We entrusted to Abraham and Ishmael: "You shall purify My sanctuary for those who visit, those who are devoted, and for those who kneel and PROSTRATe. (l-sujūdi)"
We see the shifting of thy face towards the sky; We will thus set for you a focal point that will be pleasing to you: "You shall set yourself towards the Restricted TEMPLE l-masjidi; and wherever you may be, you shall all set yourselves towards it." Those who have been given the Scripture know it is the truth from their Lord. And God is not unaware of what you do. And from wherever you go out, you shall set yourself towards the Restricted TEMPLE l-masjidi; it is the truth from your Lord; and God is not unaware of what you do. And wherever you go out, you shall set yourself towards the Restricted TEMPLE (l-masjidi). And wherever you may be you shall set yourselves towards it; that the people will have no room for debate with you, except those of them who are wicked. You shall not fear them, but fear Me; so that I may complete My blessings upon you and that you may be guided. It has been made lawful for you during the night of fasting to approach your women sexually. They are a garment for you and you are a garment for them. God knows that you used to betray your souls so He has accepted your repentance, and forgiven you; now you may approach them and seek what God has written for you. And you may eat and drink until the white thread is distinct from the black thread of dawn; then you shall complete the fast until night; and do not approach them while you are devoted in the TEMPLES (l-masājidi). These are God's boundaries, so do not transgress them. It is thus that God makes His revelations clear to the people that they may be righteous. And kill them wherever you find them, and expel them from where they expelled you, and know that persecution is worse than being killed. And do not fight them at the Restricted TEMPLE (l-masjidi) unless they fight you in it; if they fight you then kill them, thus is the reward of the disbelievers. And complete the Pilgrimage and the visit for God. But, if you are prevented, then make what is affordable of donation, and do not shave your heads until the donation reaches its destination; but whoever of you is ill or has an affliction to his head, then he may redeem by fasting or giving a charity or a sacrifice. But if you are able, then whoever continues the visit until the Pilgrimage, then he shall provide what is affordable of donation; but for he who cannot find anything, then he must fast for three days during the Pilgrimage and seven when he returns; this will make a complete ten; this is for those whose family is not present at the Restricted TEMPLE (l-masjidi). And be aware of God, and know that God is severe in retribution. They ask you about the restricted month: "Is there fighting in it?" Say: "Much fighting is in it, and to repel from the path of God and to disbelieve in Him, and at the Restricted TEMPLE (wal-masjidi), to drive its inhabitants out is far greater with God, and persecution is worse than being killed." And they still will fight you until they turn you back from your system if they are able. And whoever of you turns back from his system, and he dies while disbelieving, then these have nullified their work in this life and the next; these are the people of the Fire, in it they will abide eternally! "O Mary, be devoted to your Lord and PROSTRATe (wa-us'judī ) and kneel with those who kneel." They are not all the same, from the people of the Scripture are a nation that is upright; they recite God's revelations during parts of the night and they PROSTRATe (yasjudūna). And if thou are with them and hold the contact-method for them, then let a group from amongst them stand with you and let them bring their weapons; and when they have PROSTRATed (sajadū ) then let them stand guard from behind; and let a group who has not yet contacted come and contact with you, and let them be wary and let them bring their weapons with them. The rejecters hope that you would neglect your weapons and goods so they can come upon you in one blow. There is no sin upon you if you are impeded by rainfall, or if you are ill, that you keep from placing down your weapons. And be wary. God has prepared for the rejecters a humiliating retribution. And We raised the mount above them for the covenant they took, and We said to them: "Enter the gate while PROSTRATing (sujjadan)," and We said to them: "Do not transgress the Sabbath," and We took from them a solemn covenant. O you who believe, do not violate God's decrees, nor the restricted month, nor the donations, nor what is regulated, nor the safety made by the Restricted Sanctuary; for they are seeking a bounty from their Lord and a blessing. And when it is permitted for you, then you may hunt. And let not the hatred of another people; because they had barred you from the Restricted TEMPLE (l-masjidi); make you aggress. And bond together in piety and righteousness, and do not bind together in sin and aggression. And be aware of God, for God's retribution is severe. And We created you, then We shaped you, then We said to the Angels: "SUBMIT (us'judū) to Adam;" so they SUBMITted (fasajadū) except for Satan, he was not of those who SUBMITted (l-sājidīna). He said: "What has prevented you from SUBMITting (tasjuda) when I have ordered you?" He said: "I am far better than him, You created me from fire and created him from clay!" Say: "My Lord orders justice, and that you be devoted at every TEMPLE masjidin, and that you call on Him, while being faithful to Him in the system; as He initiated you, so you will return." O Children of Adam, dress nicely at every TEMPLE masjidin, and eat and drink and do not indulge; He does not like the indulgers. And the magicians went down PROSTRATing sājidīna. And they were told: "Reside in this town and eat from it as you please, and Say: "Our load is removed," and enter the gate while PROSTRATing sujjadan, We will forgive for you your wrong doings, and We will increase for the good doers." Those who are at your Lord, they are never too proud to serve Him, and they glorify Him, and to Him they SUBMIT yasjudūna. And why should God not punish them when they are turning others away from the Restricted TEMPLE l-masjidi, and they were never its protectors! Its protectors are the righteous; but most of them do not know. How can those who have set up partners have a pledge with God and with His messenger? Except for those with whom you made a pledge near the Restricted TEMPLE l-masjidi, as long as they are upright with you, then you are upright with them. God loves the righteous. It was not for those who have set up partners to maintain God's TEMPLES masājida while they bear witness over their own rejection. For these, their works have fallen, and in the Fire they will abide. Rather, the TEMPLES masājida of God are maintained by he who believes in God and the Last Day, and he holds the contact-method, and he contributes towards betterment, and he does not fear except God. It is these that will be of the guided ones. Have you made the watering of the pilgrim and the maintenance of the Restricted TEMPLE l-masjidi the same as one who believes in God and the Last Day and he strives in the cause of God? They are not the same with God. And God does not guide the wicked people. O you who believe, those who have set up partners are impure, so let them not approach the Restricted TEMPLE l-masjida after this calendar year of theirs; and if you fear poverty, then God will enrich you from His blessings if He wills. God is Knowledgeable, Wise. And there are those who establish a TEMPLE masjidan to do harm and cause rejection, and to divide between the believers, and as an outpost for those who fought God and His messenger before. They will swear that they only wanted to do good, and God bears witness that they are liars. Do not uphold in it ever. A TEMPLE lamasjidun that is founded on righteousness from the first day is more worthy that you uphold in it; in it are men who love to be cleansed. And God loves the cleansed. Those who repent, those who serve, those who thank, those who wander in devotion, those who kneel, those who PROSTRATe l-sājidūna , those who order good and deter from evil, and those who keep the boundaries of God. And give good news to the believers. When Joseph said to his father: "My father, I have seen eleven planets and the sun and the moon, I saw them SUBMITting sājidīna to me." And he raised his parents on the throne, and they fell in PROSTRATion sujjadan to Him. And he said: "My father, this is the interpretation of my vision from before. My Lord has made it true, and He has been good to me that he took me out of prison and brought you out of the wilderness after the devil had placed a rift between me and my brothers. My Lord is kind to whom He wills. He is the Knowledgeable, the Wise." And to God SUBMIT yasjudu all who are in the heavens and the Earth, willingly and unwillingly, as do their shadows in the morning and the evening. "So when I perfect him, and blow of My spirit in him, you shall SUBMIT sājidīna to him." Thus, all of the Angels SUBMITted fasajada. Except for Satan, he refused to be with those who SUBMITted l-sājidīna. He said: "O Satan, what is the matter that you are not with those who have SUBMITted l-sājidīna ?" He said: "I am not to SUBMIT li-asjuda to a human You have created from a hardened clay." So glorify with the praise of your Lord, and be of those who PROSTRATe l-sājidīna. Did they not see that anything God creates, its shadow inclines to the right and the left SUBMITting sujjadan to God, willingly? And to God SUBMIT yasjudu all those in the heavens and all those on the Earth, from the creatures as well as the Angels, and they are not arrogant. Glory be to the One who took His servant by night from the Restricted TEMPLE l-masjidi to the most distant TEMPLE l-masjidi which We had blessed around, so that We may show him of Our signs. Indeed, He is the Listener, the Seer. If you do good, then it will be good for you, and if you do bad, then so be it. But when the promise of the second time comes, they will make your faces filled with sorrow and they will enter the TEMPLE l-masjida as they did the first time, and they will strike down all that was raised up. And We said to the Angels: "SUBMIT us'judū to Adam." So they SUBMITted fasajadū except for Satan, he said: "Shall I SUBMIT a-asjudu to one you have created from mud!" Say: "Believe in it or do not believe in it. Those who have been given the knowledge before it, when it is recited to them, they fall to their chins PROSTRATing sujjadan." And as such, We revealed their case so that they would know that God's promise is true and that there is no doubt regarding the Hour. They argued amongst themselves regarding them, so they said: "Erect a monument for them!" Their Lord is fully aware of them, those who managed to win the argument said: "We will construct a TEMPLE masjidan over them." And We said to the Angels: "SUBMIT us'judū to Adam." So they all SUBMITted fasajadū except for Satan, he was of the Jinn, so he disobeyed the order of his Lord. "Will you take him and his progeny as allies besides Me, while they are your enemy?" Miserable for the wicked is the substitute! Those are the ones whom God has blessed from amongst the prophets from the progeny of Adam, and those We carried with Noah, and from the progeny of Abraham and Israel, and from whom We have guided and chosen. When the revelations of the Almighty are recited to them, they fall down PROSTRATing sujjadan, and in tears. So the magicians went down in PROSTRATion sujjadan. They said: "We believe in the Lord of Aaron and Moses." And We said to the Angels: "SUBMIT us'judū to Adam." They all SUBMITted fasajadū except for Satan, he refused. Did you not see that to God SUBMIT yasjudu what is in the heavens and what is in the Earth, and the sun and the moon and the stars and the mountains and the trees and what moves, and many of mankind, and many who have deserved the retribution. And whoever God disgraces, then none can honour him. God does what He pleases. Those who have rejected and repel from the path of God and the Restricted TEMPLE wal-masjidi that We have made for mankind, for the dweller or the visitor to it; and whoever inclines to evil action in it, We will let them taste a painful retribution. And We have appointed to Abraham the place of the sanctuary: "Do not set up anyone with Me, and purify My sanctuary for those who will partake, and those who will enforce, and those who kneel and PROSTRATe. (l-sujūdi)"
The ones who were driven out of their homes without justice, except that they said: "Our Lord is God!" And if it were not for mankind being pitted against one another, then many monasteries, synagogues, contact-methods, and TEMPLES wamasājidu where the name of God is frequently mentioned would have been destroyed. God will give victory to those who support Him. God is Powerful, Noble. O you who believe, kneel and PROSTRATe wa-us'judū and serve your Lord and do good that you may succeed. And if they are told: "PROSTRATe us'judū to the Almighty." They Say: "And what is the Almighty? Shall we PROSTRATe anasjudu to what you order us?" And it increases their aversion. And those who stay awake for their Lord, in PROSTRATion sujjadan and standing. So the magicians went down PROSTRATing sājidīna. And your movements amongst those who PROSTRATe l-sājidīna. "And I found her and her people PROSTRATing yasjudūna to the sun instead of God! And the devil had made their work appear good to them, so he kept them away from the path, for they are not being guided." "Will they not PROSTRATe yasjudū to God who brings out what is hidden in the heavens and the Earth, and He knows what you hide and what you declare?" The only people who believe in Our revelations are those whom when they are reminded by them, they fall PROSTRATing sujjadan, and they glorify the praise of their Lord, and they are not arrogant. "So when I have evolved him, and breathed into him from My spirit, then you shall SUBMIT sājidīna to him." He said: "O Satan, what prevented you from SUBMITting tasjuda to what I have created by My hands? Are you too arrogant? Or are you one of those exalted?" As for one who is meditating in the night, PROSTRATing sājidan and standing, fearing the Hereafter, and seeking the mercy of his Lord. Say: "Are those who know equal to those who do not know?" Only those who possess understanding will remember. And from among His signs are the night and the day, and the sun and the moon. Do not PROSTRATe tasjudū to the sun, nor the moon; you shall PROSTRATe wa-us'judū to God who created them, if it is truly Him you serve. They are the ones who rejected and barred you from the Restricted TEMPLE l-masjidi, and barred your donations from reaching their destination. And there had been believing men and women whom you did not know, and you may have hurt them, and on whose account you would have committed a sin unknowingly. God will admit into His mercy whomever He wills. Had they become separated, We would then have punished those of them who rejected with a painful retribution. God has fulfilled with truth His messenger's vision: "You will enter the Restricted TEMPLE l-masjida, God willing, secure, with your heads shaven and shortened, having no fear." Thus, He knew what you did not know, and He has coupled with this a near victory. Mohammed is the messenger of God, and those who are with him are severe against the rejecters, but merciful between themselves. You see them kneeling and PROSTRATing sujjadan, they seek God's blessings and approval. Their distinction is in their faces, as a result of PROSTRATing l-sujūdi. Such is their example in the Torah. And their example in the Injeel is like a plant which shoots out and becomes strong and thick and it stands straight on its trunk, pleasing to the farmers. That He may enrage the rejecters with them. God promises those among them who believe and do good works a forgiveness and a great reward. And from the night glorify Him, and after PROSTRATing l-sujūdi. You shall PROSTRATe fa-us'judū to God, and serve. And the stars and the trees SUBMIT (yasjudāni). The Day will come when they will be exposed, and they will be required to PROSTRATe (l-sujūdi), but they will be unable to. With their eyes subdued, humiliation will cover them. They were invited to PROSTRATe (l-sujūdi) when they were whole and able. And the TEMPLES l-masājida are for God, so do not call on anyone with God. 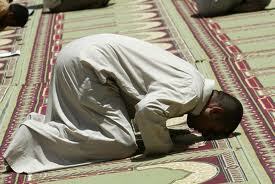 And from the night you shall PROSTRATe (fa-us'jud) to Him and praise Him throughout. And when the Quran is being related to them, they do not PROSTRATe (yasjudūna). Alas, do not obey him, PROSTRATe wa-us'jud and come near.